It seems to be an annual event these days that F1 pitches up at a new venue. But 2011's debut venue carries more weight than most. This is because F1 is holding a race in India for the first time ever. This of course represents a massive opportunity for F1. To use terms that the sport's power brokers understand, India is a highly populous potential 'market', a point that's given particular centrality by India's status as a coming force in the world economy. However, F1's record in establishing new events in its recent eastwards expansion is, well, patchy. Of course, the round at Singapore, and at Japan before it, have been clear successes. But we've seen in the likes of Malaysia, Turkey and China that local interest in these 'new' countries can be hard to sustain or even to establish in the first place. Even Korea a fortnight ago, in but its second race, showed some signs of faltering. Still, today's practice session seemed a good start for the Indian Grand Prix. The Buddh International Circuit has received a universal thumbs up. The layout is typical Herman Tilke, one part long straights book-ended by sharp but wide corners, which should promote plenty of overtaking, the other half distinguished by sequences of rapid curves, one reminiscent of turn 8 at Turkey. The average speed is pretty quick by modern F1 standards and there is a refreshing abundance of elevation change as well. 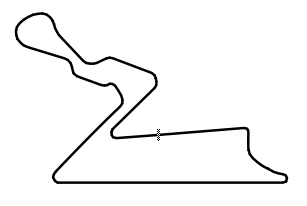 Some are calling it Tilke's best effort at a racing circuit so far. The one bum note is that, as James Allen has pointed out, there's almost nothing in the circuit that is distinctively Indian, disappointingly. Watching practice today you could have been watching an F1 practice session in any country. Bit of a missed opportunity there. Another encouraging factor for India's F1 debut is that there's evidence that Sunday's race will be a close one. The big three teams - Red Bull, McLaren and Ferrari - all have reason to be modestly cheerful after today's running. Red Bull, let's face it, are always strong and looked good today allowing for that they usually run a bit more fuel than their rivals for their qualifying simulation-type runs. McLaren have been in good form in recent times (they took pole last time out and only a fumble deprived them of that prize the time before that), and there's evidence they're right there on longer run pace, if not over a single lap. They do however have another headache involving Lewis Hamilton troubling the stewards. Lewis will have to swallow a three-place grid penalty for tomorrow, not what he wants in a season that only Jenson Button has won a race from starting outside the first three places. And frankly Lewis was bang to rights this time - going through a double-waved yellow flag zone wherein marshals were the 'wrong' side of the barriers at full pelt and with the DRS open, an act that will get you punished at any level of motor sport (though, in his defence, he may have been caught out by the yellow light in his cockpit from the universal feed likely being off). Sergio Perez received the same punishment for the same offence. Then there's Ferrari, who claimed first and third places in the second practice session, with Felipe Massa ahead, continuing his improved recent form. There have been some suggestions that they were running lighter than their two main rivals, but they'll be encouraged nevertheless. They also appear to be getting Red Bull-like minimal ground clearance from their new and much commented on front wing (despite conspicuous flapping) which will also make them smile. Not for the first time though, Ferrari have their harder tyre elephant in the room to consider. Pirelli have gone conservative given we're at a new and rather unknown track, and have brought the hard tyre, which causes the Ferrari team particular palpitations (remember Spain?). Massa for one has commented that Pirelli have erred on the side of caution too much, with degradation apparently lower than expected. Indeed, we may see a repeat of the Nurburgring race where most will seek to minimise the time spent on Sunday on the harder tyre to an extreme level, given its likely markedly slower pace than the soft.